- Also remove roofs always off as standard. - A suggestion would be to move all required items into the same tab to make banking quicker. - Barrows tabs - I have not coded the walk to barrows so please use teleport tabs. - Kills brothers 1-5 on the hills then will go to the 6th and enter crypt tunnels. - Clan Wars portal support to restore stats. A: Change to resizable mode. A: Your items have likely changed ID, for example Karils coif going from 100 -> 75. Check the log (Help -> View log) and it'll tell you what it's searching for. A: Check your main weapon is charged. A: Most likely cause is having your chatbox minimised like so, please make the chatbox visible. Q: How does it decide to bank or do another trip? A: This is based off of how many resources you've used on that specific trip, there is also a buffer, it doesn't use the exact amount, it must have 2 more food than you used on the trip you just completed and 3 more doses of prayer restoration. Q: I've heard you record data? A: Yes, I record data to help with usage tracking and debugging, for example if you look below you'll see I offer a dynamic signature to help you track your own progress. Q: Does this work for pures? A: You'll take a lot of damage, it'll work the same as any other account but it won't change attack styles unless you're using a salamander so your defence will be safe. Q: How long should I run it for? A: Follow the bot smart guide. 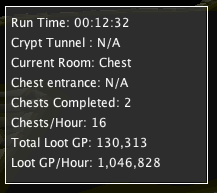 Q: Whats the longest run recorded? A: A little over 12 hours straight, no pausing or stopping. 38 chests were completed in this run, the user was rocking a -18 magic bonus wearing melee armour hence the low amount of chests done. 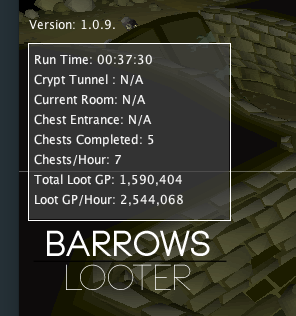 Also please do not start during a barrows run i.e. with brothers already complete. It should still work but is not recommend. Start the script with your setup already sorted so it can calculate all the necessities. This will use magic for all brothers with Ahrim being the exception. Please bring a range switch for Ahrim. The part everyone's been waiting for. 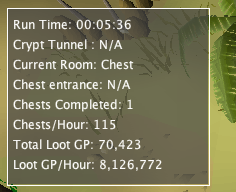 According to the wiki it's 1.25m per hour varying on RNG and also whether you get double runes for having the M diaries done. Here is a tutorial/not sped up walk through. *DISCLAIMER* I am not responsible for any loss of gp/items if you die. 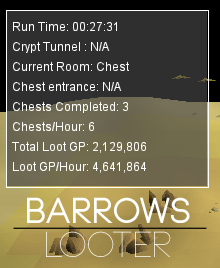 In 250+ chests I have not died so I do not expect you too either but I cannot guarantee that. Its live on the SDN, go gettem! - Swamp & Sea Trident"
I read ibans staff is best to do this with? is there any chance to add that and iban blast to the spell list? Ibans is awful, it’s only really used by iron men as you need high slayer to get a trident. I’d recommend a trident above all else. If there’s enough demand I’ll look at adding ibans but due to how bad it is, I’d really rather not. Anyone having issues with opening the sarcophagus? Literally everything else is working. Would it be possible to add a third switch for a melee weapon or back to blowpipe when it kills for potential? Adding a melee switch won’t make that much difference in speed really. 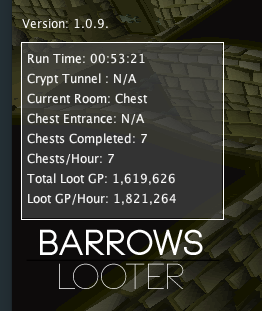 Regarding the looting it did the last run I did but I’ll double check and with the banking you need to be more specific... where are you teleporting too? Teleporting to Kharyll. 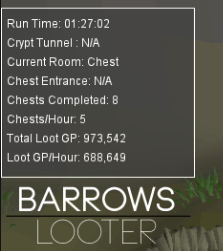 Basically will teleport after looting and won't proceed to go to the bank, I had to manually go to the bank then resume script however, when i resume the script it just seems to open and close bank repeatedly and won't work again till i close the script. Alright thanks I’ll take a look, I will probably rewrite my banking class as it’s a mess but I’ll check out the teleporting, thanks for letting me know! 0945 [00:18:26][Banking|Task]:Ready to close bank and restore run. Now I have energy potions in the bank right next to all other items needed for script. Ahh crap I’ll take a look at it, does it ever withdraw them or just close and reopen without withdrawing? 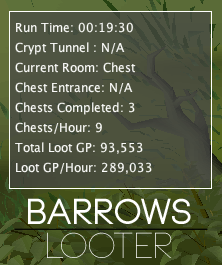 I'm working on some of the fixes as we speak but just did a flawless 3 chest run. @person It doesn't drop food to make space for loot it will eat the food, tested and works fine. @Nom I checked out the opening of the sarcophagus but I'm not having any issues with it, I've added a print line to it so if it happens again please let me know. @Sp00ns Fixed the issue with the stairs and it not leaving. If it happens again please let me know. Brilliant script - reckon it could drop empty vials? ty!